This year around 12 members of the Brussels Brontë Group headed for Haworth for the annual Brontë Society AGM weekend. Visitors to Haworth are not always in danger of getting sunburned on the moors, but this year the weather was so kind to us we needed our sun hats. Many of us joined an organised walk to Top Withens, the ruined farmhouse high on the moors thought to have inspired the location of Wuthering Heights, led by local historian Steve Wood, who also gave a talk on the history of the spot over the weekend. One of the fixtures of the weekend is of course the Annual General Meeting itself, which gives an insight into how the Brontë Parsonage Museum is run. The Bronte Society, which currently has around 1500 members, is one of the oldest literary societies in the world (in the UK there are societies in honour of practically every well-known writer). It was set up in 1893 and has run the Museum since the Parsonage was gifted to it in 1928. The governing board, or trustees, of the Society (‘Council’) is elected by members and delegates the day-to-day running of the Museum to a Director and other staff. As well as maintaining and acquiring manuscripts and artefacts, and books for its library, the Museum is a vibrant creative centre with a very full educational and arts programme (talks by writers, art exhibitions, activities for schoolchildren). The AGM always includes a presentation on developments during the year at the Museum which this year was given by its new Director, Ann Sumner. The TV Brontë documentary broadcast in March, in which our Brussels members took part, was seen by over 10 million viewers and has brought many new visitors to the Museum. The main excitement in the past year was the complete redecoration of the Parsonage with bespoke wallpapers and curtain fabrics, based on analysis of evidence such as scraps of wallpaper surviving from the period. Some rooms reflect the look of the house when all four siblings were alive, others Charlotte’s improvements and ‘gentrification’ when she became wealthier in the 1850s. On Sunday morning we were able to inspect the new look at a special early opening for members only. 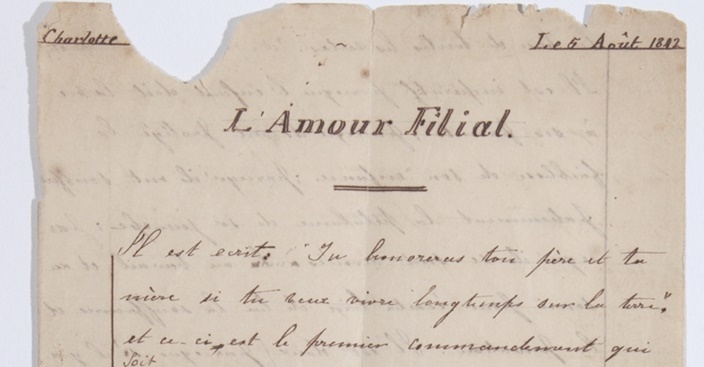 A new acquisition was on view that is of particular interest for Brussels members: a devoir, French essay, of Charlotte’s that fell out of a book in a private collection last year – apparently the owner had no idea it was there. Members contributed £3000 towards this purchase. 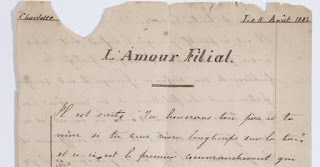 Called L’Amour Filial, it was written in August 1842 and includes a few corrections by M. Heger. How many other undiscovered Belgian essays of the Brontës are out there? Could there be one in an old volume on your bookshelves or perhaps in an antiquarian bookshop in Brussels? Under the new Director there are plans to further improve and also expand the Museum. ‘Visioning strands’ in the ‘vision for the future’ include a café and toilets. Apart from walks on the moors, the AGM and visits to the Parsonage, another traditional feature of the weekend is a special service for Society members in the church where Patrick Brontë preached for 40 years. 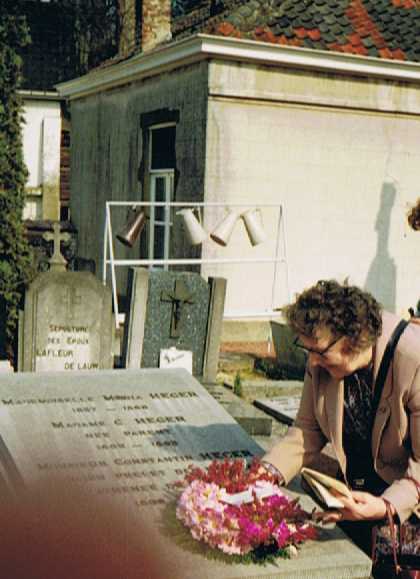 Whether habitual church-goers or not, most members appreciate this opportunity to remember the members of the Brontë family in the church where they are buried and where they worshipped each Sunday. There are readings by Society members and Museum staff. The address always reflects on a particular member or aspect of the Brontë family and is often given by a guest speaker, this year the Vicar of Hartshead where Patrick was curate before moving to Haworth. (Poor Patrick was destined to be a curate all his life. He was never Vicar in Haworth because at that time it was part of the parish of Bradford rather than a parish in its own right). 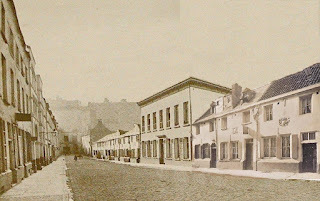 The address included anecdotes of the problems faced by new curates in Haworth, where the church trustees and congregation sometimes objected to the ministers appointed for them by Bradford; on one occasion they caused havoc during a church service, prevented an unpopular new incumbent from preaching his sermon and hounded him out of the village. This year, local primary schoolchildren took part in the church service, singing and reading one of Charlotte’s poems. As always, too, there were lectures and entertainment. In his talk on Byron and Emily Brontë in a cosy Main Street café venue, the Yorkshire poet Andrew Mitchell read us his narrative poem The Death of Lord Byron about the progress of Byron’s funeral cortege from London to the family vault in Nottinghamshire, giving the thoughts of some of those who saw the procession pass – Keats, Coleridge and the poet’s former lover Lady Caroline Lamb, among others. He then examined similarities between Byron’s and Emily’s personalities and writings. We learned that Byron was able to give freer rein to his love of animals than Emily; while studying at Cambridge he kept a menagerie that included a bear and three monkeys. Pointing out that the concept of the Byronic hero, which influenced Emily in Wuthering Heights, was in turn influenced by Milton and the character of Satan in Paradise Lost, Mitchell categorised Wuthering Heights as a Romantic novel in the Miltonic tradition. The entertainment provided over the weekend included Michael Yates’ play The Brontë Boy featuring a tortured Branwell Brontë. Most of this play was fairly predictable though there were some surprises – such as a voluptuous, giggly Emily – and some apparently deliberate deviations from the facts; for instance, Heger returns one of Charlotte’s letters to her, which she then reads it to her brother. And jazz singer Val Wiseman, who leads the Society’s London group, performed the songs on her album relating the story of the Brontë family and their novels and fictional characters, Keeping the Flame Alive. The witty and moving lyrics were written by Val herself. On Sunday night, as is the tradition, we provided our own entertainment at a dinner in the Old White Lion, attempting to write limericks on Brontë themes and enjoying a sketch called Fawlty Parsonage written by the Brontë Society Membership Officer and performed by Museum staff. Monday and Tuesday we had excursions to two interesting historical houses, the Elizabethan Levens Hall near Kendal in the Lake District and Oakwell Hall in Birstall. The Brontë link with Levens Hall is somewhat tenuous (not that we minded this! ); the 1999 BBC series of Brontë biographer Elizabeth Gaskell’s Wives and Daughters was filmed there. We also visited the farmhouse in Silverdale, Morecambe Bay, where the novelist spent summer holidays. Oakwell Hall has a less tenuous link with the Brontës; Charlotte visited it when staying with her friend Ellen Nussey and used it in her novel Shirley as Fieldhead, the home of the novel’s heroine. We were given a brilliant guided tour enlivened by ghost stories and the sight of groups of schoolchildren, demure in period costume with white caps, being instructed in crafts of the period by ladies in shawls and aprons. 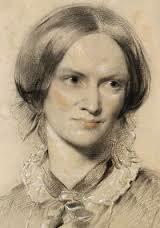 The next Brontë Society AGM weekend is on 14-15 June 2014. The full programme of events always begins on Friday and ends on Tuesday. We hope many more Brussels Group members will join us in Haworth next year. One of the most pleasant surprises of the weekend for me was Val Wiseman’s performance on Saturday evening. I knew Val had a beautiful voice and I had heard some of her songs on CD, but the way she brought the Brontë story through her songs and her comments was just amazing. 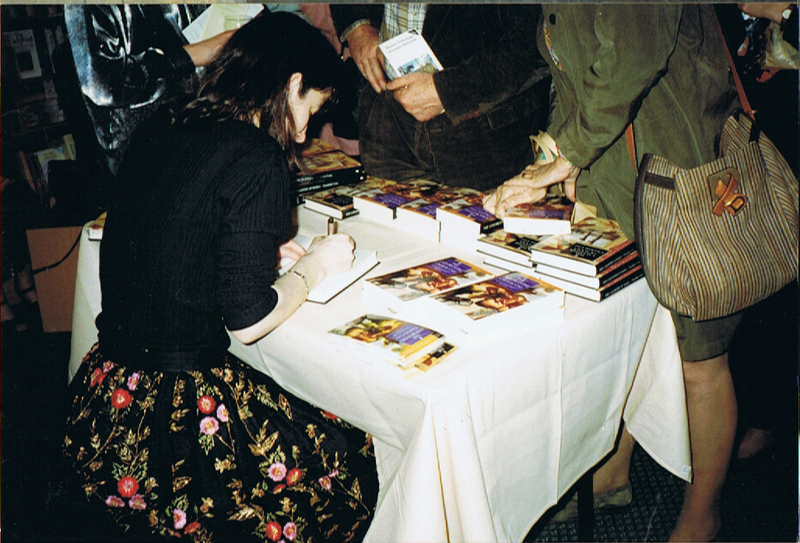 There was a wonderful feeling of intimacy with the audience and so much respect for the Brontë family. I thoroughly enjoyed the evening and could have stayed a bit longer to listen to Val’s interpretation of the Brontë’s lives and work. Very good entertainment. On the other hand, “The Brontë boy” was a bit of a disappointment to me. Having read so many good reviews, I expected so much of it. The respect I found in Val’s performance was lost to me in this one. I could hardly recognize father Patrick, Charlotte, Anne and certainly not Emily (my goodness!!). And Branwell was all too gloomy all the time, it seemed as if he really was doing everything against his will. The only character I liked was John Brown. On the whole, I had mixed feelings about this play. I would certainly not recommend it further. But throughout the weekend I really enjoyed the walks and the talks, and the wining and dining, and the excursions. It is a pity that the Brontë Society has decided to move the AGM to a date a week later, and that therefore I might most probably not be able to attend! This year sees the 20th Anniversary of the first Excursion made by members from the Brontë Society. A few of our current BBG members were there to witness that week in April 1993. Eric Ruijssenaars and Maureen Peeck have given their personal accounts. It was twenty years ago last month that the memorable Brontë Society Excursion took place. Not only was it, on hindsight, an important step towards the creation of the Brussels Brontë Group, it also quite changed my life. In a way the Excursion feels like it happened fairly recently, but in reality it has entered the realms of history, with research needed to recall those magical five days.I remember the excitement started months before, when Selina, our friend Elle and I decided to join. 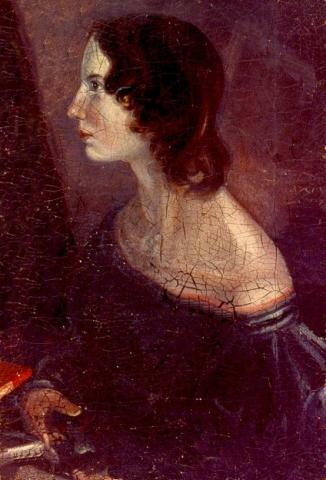 Elle, as readers of Helen’s book will recall, had made me a Villette fan and researcher. I had written for her a history of the Isabella quarter. It became the first chapter of my first book, which might not have existed without that Excursion. And my career certainly would have been different without the book.The ‘photographic memories’ I have are only a few. Selina dressed as Jane Eyre is unforgettable to all. Apart from her, the other scene that comes to mind is us three and three British ladies, in the Park, near the Kiosk, probably. One of them was Dyddgu Pritchard-Owens, from north Wales. She’s still a dear friend. I thought we first met on the Tuesday, but she, when I asked her about it on the phone, immediately said it was at the graves of M. and Mme. Heger at Boitsfort, on the Wednesday. 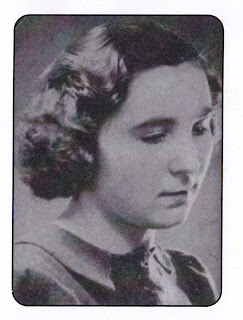 Pearl Cragg was one of the other two ladies. In the dark days, when Villette and Brussels were all but forgotten, she and Elle were the only Villette fans left. Pearl made pretty much annual pilgrimage journeys to Brussels. She knew all most of what was known, which wasn’t much however. Without Pearl the Society might still not have organised an Excursion to Brussels. The greatest compliment I later got for my books were given by her. They were her constant bedside books, she once told me. Pearl was also there at the 2003 Excursion. That was her last visit to Brussels. The rise of the BBG must have pleased her greatly. She died in 2011. 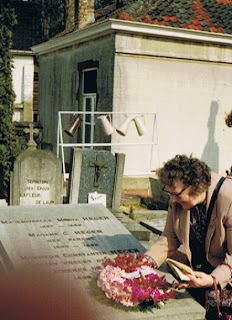 Dyddgu remembers that Pearl laid one rose on M. Heger’s grave. I remember M. Fierens giving a fascinating talk. An eternal regret is that I did not make notes. 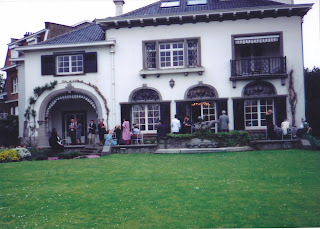 I also remember a few scenes at the Place Rogier hotel where the Society members were staying, and waving goodbye to them when they left from there on the Friday. There is also the memory of Charlotte Cory and me sitting at a bar, somewhere, on the Wednesday I think. She was quite impressed by the pile of research papers I showed her, and encouraged me to apply for the Brontë Society Centenary scholarship. 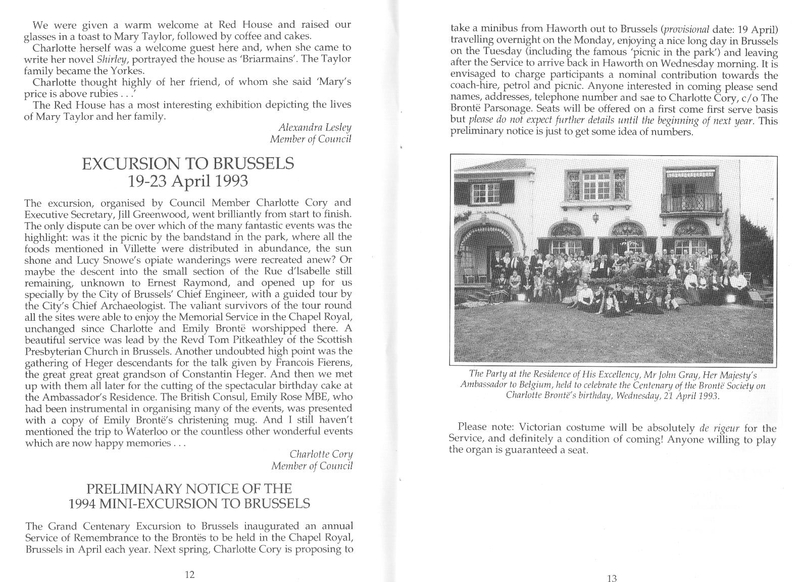 Charlotte does deserve much credit for organising the Excursion to Brussels, for the first time in, indeed, the Society’s 100 years of existence. Slowly some memories come back. Maureen Peeck, a dear friend ever since too, I first met at about the arrival of the coach from England with the Society members. At the Place Rogier. That cannot have been before about 3 pm. The British members must have been horribly exhausted. The coach had left from Haworth at 2 am, according to the the programme booklet. “Approximate arrival at Ostende: 3 pm.”The Tuesday we spent in and around the Isabella quarter. 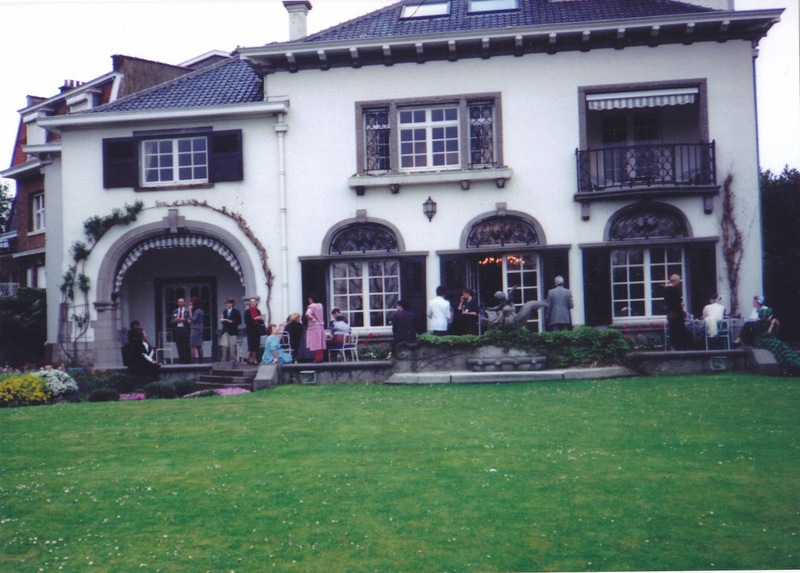 On Wednesday we visited Boitsfort and Waterloo, and in the evening there was the great party at the residence of the British ambassador. A great party indeed, yet I only have the scenic memory of the photograph I have, and nice flowering plants behind where the photographer stood. On Thursday we went to the Park Theatre, but I remember nothing of that. In the evening Charlotte Cory presented her (second) novel at Waterstone’s, of which I have some memories. But not of the last meal togethether at the Grand Place afterwards. 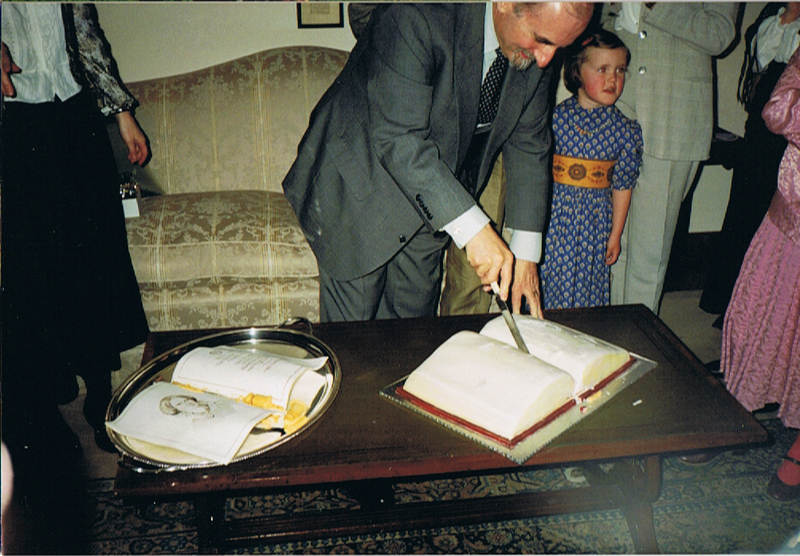 But after Dyddgu told me, I do now remember too a last, quite lenghty meeting in the hotel lounge.I will always remember it vividly as a wonderful week, one of the very best in my life. Recently I spent a pleasant day in Leiden with Eric Ruijssenaars. Naturally we were reminiscing about our Brontë experiences and suddenly realised that we had known one another for twenty years. We met 20 years ago in Brussels at the April 1993 Brontë Society Excursion. 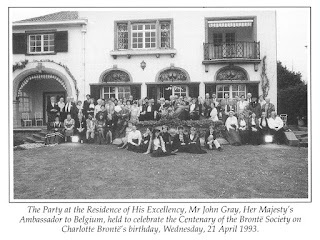 I had never been to Brussels before and, though I had been a life-member of the Brontë Society since 1974, I had never then been to any Brontë events. This was because they were always held at awkward times of the year for me. Of course I had been to Haworth at Christmas and in the summer as we had a holiday cottage in Oxenhope. 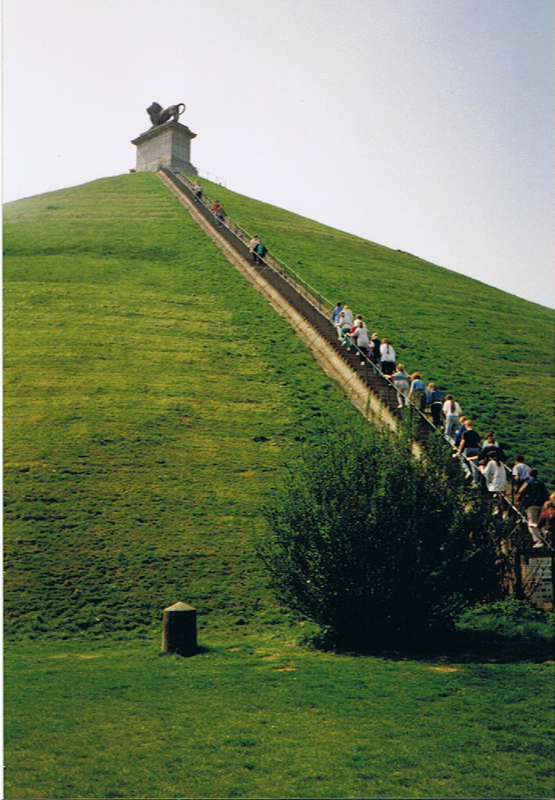 I was quite surprised at the large number of members on the excursion and how nice they were to me, a new-comer. There was such a feeling of camaraderie. I soon met up with Eric R and Selina Busch as they were the Dutch contingent and I also live in the Netherlands, (though English). They took me on a little tour of Brontë sites. They were already researching the area and had been studying the archives at the city registers. They took me down the narrow rue Villa Hermosa which comes to a dead end at a side wall of Le Palais des Beaux Arts. Originally of course this had led down to the rue d'Isabelle where the Pensionnat was situated. Another highlight was our visit to the British Embassy on the anniversary of Charlotte Brontë's birthday. 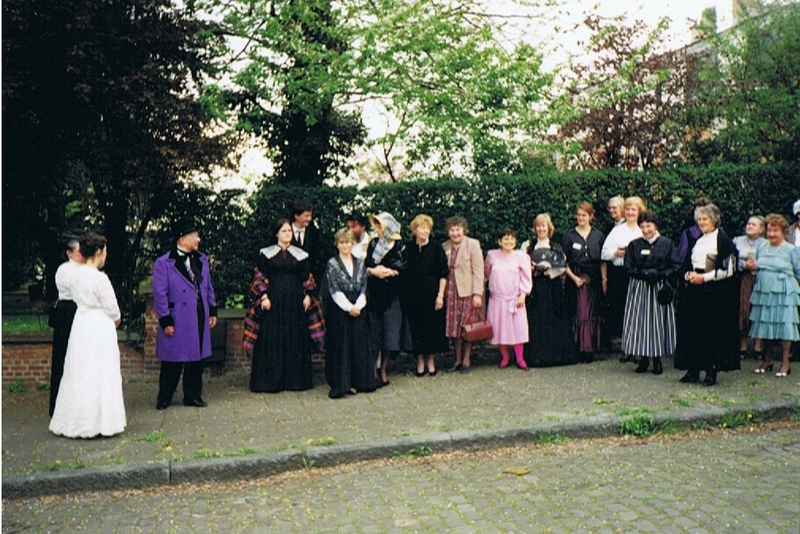 We were all supposed to dress in Victorian costume and indeed many people had actually entered into the spirit of the thing (see photo on p 13, Brontë Society Gazette, issue 9, July 1993) and really looked the part. We had a very enjoyable afternoon with tea on the lawn. 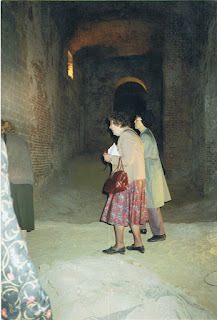 Then on another day there was the underground exploration led by the city architect. They had just started excavating the ancient palace of Charles V which lies under the present Place Royale. So we had to slither down a steep and long sandy slope and be led through the darkness ending up amazingly in the original rue d'Isabelle which we followed until it ended in another wall of the Palais des Beaux Arts. This was the part of the street which the Brontë sisters could not have known. So while their part of the street has been demolished the more ancient one remains. Finally, I well remember that M. Fierens, a descendent of M and Mme Heger, gave us a very stimulating talk about his family. 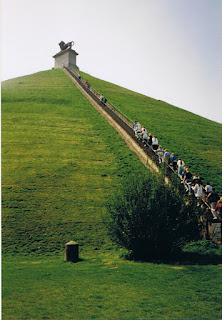 And of course our visit to Waterloo. The excursion was later reported in the BS Gazette by Charlotte Cory, who had helped to organize it.